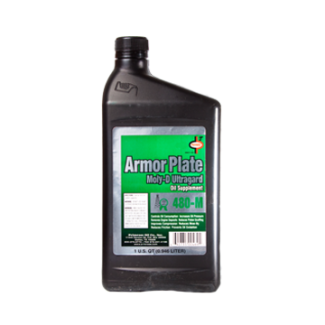 Nano Syn 251 - 1 Gallon - Lubrication Specialties, Inc.
Lubrication Specialties NanoSyn 251 is a lubricity enhancing oil additive that increases the lubricating & wear reduction properties of the host oil. The product contains patented synthetic lubricants that have unique lubricating properties even compared to PAO or mPAO synthetics of the same viscosity. The anti-wear component of the formula is a patented carbon nano particle that fills in microscopic irregularities on the machined surface to provide a smoother surface for the lubricating film to form. The synergy of these components extends the base oil performance in shear stability, oxidation stability, film strength & especially friction reduction. Heat and friction silently steal power from your engine. The scientists from LSI Institute have uncovered a powerful lubricity agent…NanoSyn 251. 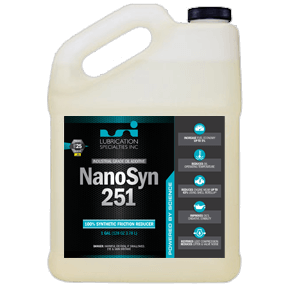 One treatment of NanoSyn 251 to your oil and your diesel will run cooler and have increased towing power. Negatively charged synthetic ester tenaciously attaches to all internal parts completely lubricating your engine. Use one treatment of NanoSyn 251 every oil change. Semi-trucks, pick-up trucks, farm equipment & autos. Effective in all engines including: Ford Powerstroke, Dodge Cummins, GM Duramax, Saab, Volkswagen, Audi. You can use NanoSyn 251 to treat any oil-lubricated system except air conditioning and aircraft. Even though NanoSyn 251 is an industrial product, you’ll find that small two cycle engines love it. Just add NanoSyn 251 to your oil before mixing it with the fuel. Your automobile, light truck or other personal vehicles will benefit from NanoSyn 251 in the engine, power steering unit, and differential.